It’s not often we get to show off all of our fitting expertise in one project, so when we do we’re always proud to show off the results. 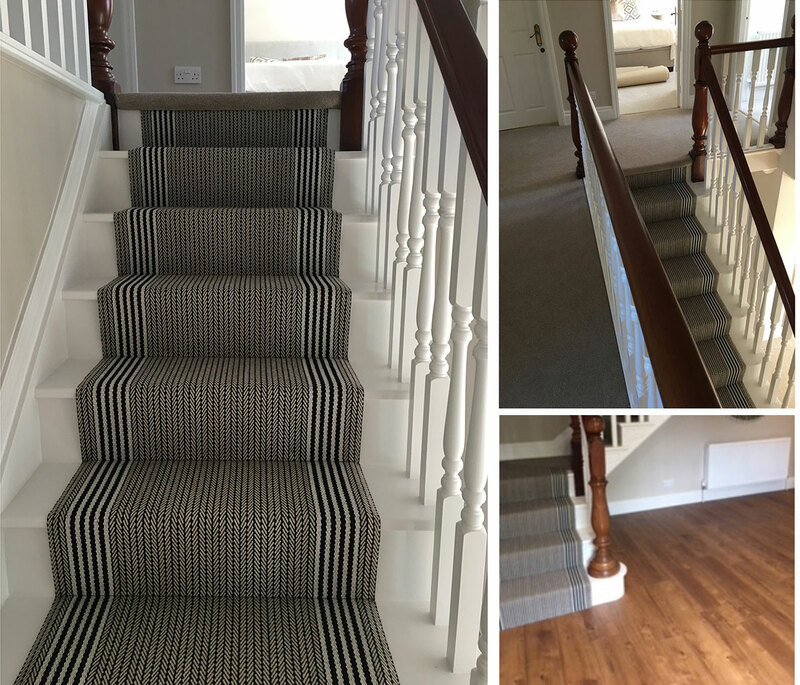 Last month we had the chance to do just that when we travelled from our store in Fulford to Hull to complete the install of a hall, stairs and landing. The choice for the hallway was pretty straightforward, Mark and Beverley wanted a stylish floor that would be practical and stand the test of time. Our go to product is Amtico Spacia, a hard-wearing flooring with visual appeal and exceptional performance – Amtico are so confident in the product they offer a 25 year warranty! The collection has some stunning selection of designs in Wood, Stone and Abstract all available in three tile sizes and three plank sizes for maximum flexibility for installation. The Royal Oak Wide Plank was chosen, rich and classic in style it is everything a great wood should be and complements the space perfectly. Those of you who have visited our Fulford store will know that we are huge fans of Roger Oates and their flatweave runners. They’re woven and hand finished in the UK using traditional techniques and the nature of the weave gives the designs added texture and the suppleness means that they can be fitted on almost any staircase – straight or winding. Mark and Beverley chose Flaxman Stone for the stairs, a classic stripe border with a sharp texture and a bold monochrome border. This 100% wool flatweave runner looks warm and inviting and is the perfect welcoming touch to the stairs. It works effortlessly with the classic plank design of Amtico Spacia Royal Oak and creates a classic and truly stylish look. Finally we installed the luxurious – soft feel underfoot – Devonia Plains on the landing in colour ‘Jellyfish’. The tufted Devonia carpets from Axminster are manufactured from 80% pure new British wool and use 2-ply yarn for supreme longevity and appearance. With sixty exquisite colours in the range, including dark rich tones, neutrals creams and contemporary greys and beiges naturally it took us a while to choose the colour but the result is perfect! If you’d like to refresh your hallway, stairs and landing with a stylish new flooring installation please get in touch, we’d be happy to help.